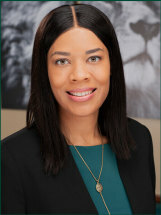 Jonelle Oldacre is an Associate Attorney with The Cromeens Law Firm, PLLC, where she focuses on practicing construction, business and real estate law. Within these practices, she handles a variety of contract disputes and reviews on an on-going basis to ensure compliance. Prior to joining the firm, Jonelle served as a Sole Practitioner and was an Associate Attorney with Hill & Hill, P.C. and Baker & Associates, both located in Houston, TX. She earned her B.A. in Political Science from the University of Oklahoma in 2004, and her J.D. from Santa Clara University School of Law in 2009. She was a finalist in the Galloway Moot Court Competition (Spring 2007) and won Best Appellate Brief in her Appellate Advocacy Course (Fall 2007). During law school, Jonelle interned at the Santa Clara County District Attorney's Office in the Juvenile Dependency Unit and the San Mateo County District Attorney's Office. She also served as Vice President of the Student Animal Legal Defense Fund and the Black Law Student Association.